BUCKIE High pupils have won a national planning award for their involvement in Moray’s Local Development Plan. The Scottish Awards for Quality in Planning celebrate achievements and this year, for the first time, included a category for ‘Children and Young People’, which highlights innovation where children and young people have made a positive impact on the planning of a place. A video, created by the students, was shown during roadshows as part of the wide-reaching public consultation on the main planning issues facing Moray in the next 10 years, including affordable housing provision. 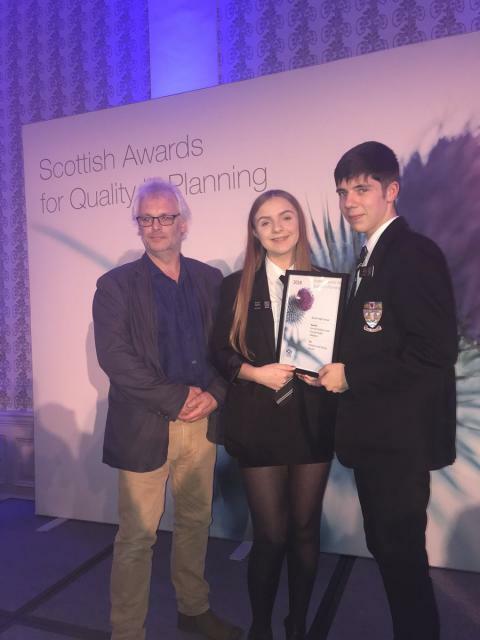 S6 pupils Kadie and Jack Smith attended the ceremony in Edinburgh on Wednesday night, accompanied by Chair of Moray Council’s Planning and Regulatory Services Committee, Cllr David Bremner. Jack spoke of the inspiration behind the video. “We didn’t want to make a video that just highlighted the problems in Moray, we challenged ourselves to try come up with solutions that we thought could resolve the issues and better the place we live in. Kadie echoed Jack’s words, and told of her shock at landing the prestigious award. Head teacher Neil Johnson said he was delighted that the team’s efforts were being recognized at such a high level. Cllr David Bremner said the pupils’ success in the Quality in Planning awards was outstanding.